Gill working on a drawing for Making a viola. You can see the entire series on the new Portfolio page, together with the complete Soundscape paintings (Portraits of composer, Errollyn Wallen) and Theme and Variations series (studies of Eden Stell Duo in rehearsal). Recent paintings explore distinct subject matter and themes in extended series. 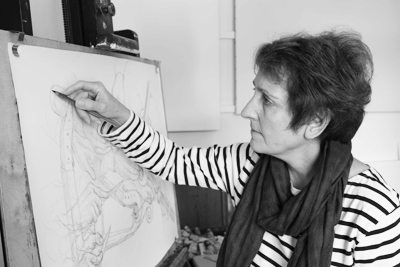 Gill grew up on the Dorset coast and the sea has been a lifelong passion and vital inspiration to her painting. Cornwall has provided source material for a succession of paintings and drawings which seek to explore different aspects of the sea and surrounding landscape (see Clay Country). The recent series of Microcosmos watercolour paintings looks at coastal landscape from a different perspective  intricate, organic miniatures, they are meditations not only on the natural world and its structure, but reflecting an interior landscape also. Microcosmos is available in printed form and as an ebook at http://www.blurb.co.uk/b/4199159-microcosmos and a range of greetings cards from Winchester Discovery Centre Shop and postcards from P & G Wells Bookshop. Her paintings have been exhibited widely: with ING Discerning Eye Exhibition, Royal Institute of Painters in Watercolour, the Royal Society of Portrait Painters, Royal Institute of Oil Painters, Royal Society of Marine Artists, all at the Mall Galleries, London; Royal Watercolour Society's 21st Century Watercolour exhibitions at Bankside Gallery, London, Southampton City Art Gallery, and numerous Open Studio Events.